Its a cup of Espresso. Exciting, seducing, crazy, definitely wont leave you bored and sleepy. Listening to the album is like walking into a fullhouse club on the weekends, not a moment of silence, strong music beats in your eardrums, storming your brains. The purpose of each song is clear and simple, just one, that is for you to live now and have fun. No need to use your brain cells or emotions to understand in depth, just shake your head and dance your body, imagine yourself in a party partying without worries. Perhaps its because of the easily understandable english and chinese lyrics, the one that leaves the most impression out of the 12 songs is ‘Feel The Beat’. Especially the part ‘Oh Eh Oh’ is most easy to remember, everytime hearing it will make you sing along, even after the song has ended. Thank you Christina & Tenshi. I’ve just bought this magazine and saw this article. Kya! So happy to see JKS & the good reviews. Shall we vote “feel the beat’ to be in the Top Ten Kpop & Jpop Chart by FM 933 airing every Sun 10pm. This Sunday will be the 2nd round! Reason to vote: To show that his song is popular in Singapore. If he knows it, he may visit our country! Oh..please come to Singapore! SMS yr vote to 146072346 : key in JKP TEAM H:FEEL THE BEAT Your name NRIC no. Kindly vote every week! Thank you! great news!!! 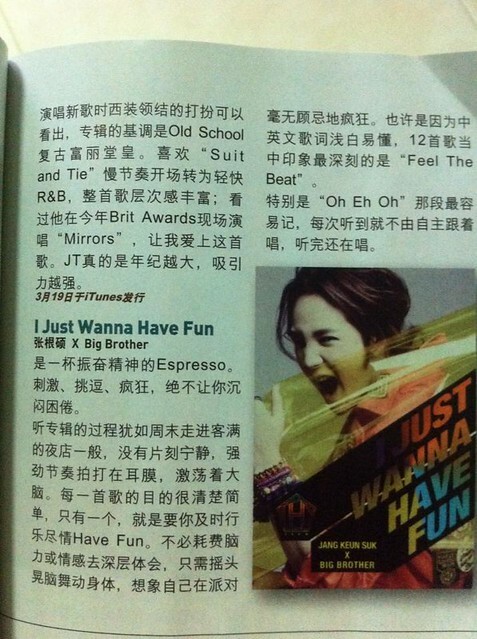 just proved that I Just Wanna Have Fun album is doing really well internationally!! !